Premier performance! Also presented Sunday September 23 as a matinee at St James Place in Great Barringon. 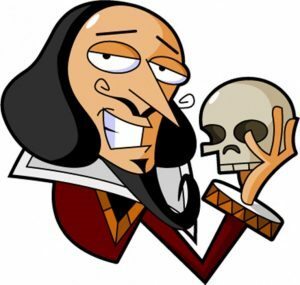 Four comic Skits; Five Actors; Costumes, and a very funny evening of what might have happened to Will Shakespeare and his plays. Since making the move to Sandisfield, author Steven Otfinoski has had his plays performed in the Berkshire Playwrights Lab’s first Radius Playwrights Festival, two BPL Writers’ Workshop Showcases, Ventfort Hall in Lenox, and most recently at the International Playwrights Festival at the Warner Theatre in Torrington, Connecticut. Steve divides his time between the Berkshires and Stratford, Connecticut, where some twenty of his short plays have been performed with the playwrights group Squarewrights, in their “Quickies in the Stacks” series. Steve reviews theater in the Berkshires for the New England Theatre Journal and teaches composition and creative writing at Fairfield University in Fairfield, Connecticut. He is also the author of more than 190 Young Adult (YA) books.